Pressed Juices Energise cleanse is beneficial for those looking for a boost! Energy is not a quick fix; it is a process in the body that requires a range of nutrients so it can preform sufficiently. Energy requires specific vitamins & minerals to help you feel at your brightest and most energized. Nutrient dense foods are a must! Consuming a balanced diet rich in vitamins and minerals ensures your daily nutrient requirements are met. Few important nutrients include B-vitamins and magnesium. B-vitamins help to convert foods into fuel, which ultimately boosts your energy levels allowing us to sustain energy throughout the day. Magnesium another very important nutrient required for our body, has over 300 roles: some of which include; ATP production (energy production), muscular contraction, nerve transmission, blood pressure regulation and helps to digest proteins, fats & carbohydrates. It is also a co-factor in the absorption of other nutrients allowing you to avoid deficiencies. Hydration is another major key! Feeling tired can often be due to dehydration. The importance of water is often overlooked. With 75% of the body made from water we can understand the range of roles it supports us with such as: regulating lymph, cell, glandular secretions as well as ensuing ensure sufficient blood flow, healthy organs and mental clarity. 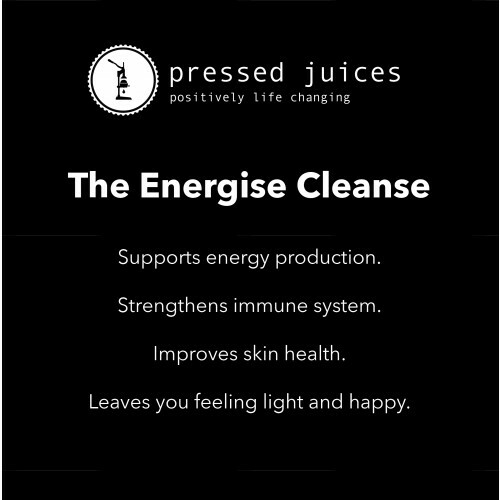 The energies cleanse covers all of the above; B-vitamins, proteins, good fats and a whole lot of hydration. During this cleanse you will also notice skin improvement and the feeling of lightness. During the Energise cleanse you may chose to participate in walking! Walking will assist with increasing blood flow & circulation, support heart health, increase muscle strength & endurance as well as fill yourself with fresh air! Fresh air allows the body to preform health digestion, strengthens your immune system, clean your lungs and leave you feeling happy.